"We have to tape everything, Pablo." One of the more recent trends in horror is that of Hollywood buying up the rights to foreign films and rebranding them with their own unique (or not so unique) American style. Studios have generally set their sights on the Far East, a tactic that has resulted in a slew of ghost stories in the form of The Ring, The Grudge, Pulse, and other films of that ilk. However, every now and then, Hollywood will dip into another pool; such was the case with 2008's Quarantine, a remake of Jaume Balagueró and Paco Plaza's Spanish horror effort [REC]. Eighteen months after its Spanish theatrical release, [REC] has finally arrived on Region 1 shores being marketed as "the film that inspired Quarantine" (a generous interpretation at best). Television reporter Ángela Vidal and her cameraman, Pablo, have been charged with covering the night in the life of a firefighter in a local Barcelona fire station. The night unfolds harmlessly enough and generally without incident until the house receives a call to assist a woman trapped in an apartment building. The incident seems innocuous enough until the elderly woman inexplicably bites one of the firefighters in the jugular, resulting in massive blood loss. In the ensuing panic, everyone involved (including the remaining tenants) discover that they've been locked in by the government, who has issued a quarantine for the building. As the night wears on, it soon becomes clear that something is very wrong, as an infection spreads and causes its victims to become rabid zombies with a taste for human flesh. [REC] seems to draw on a variety of influences, from Romero's Night of the Living Dead's general premise to the more recent Blair Witch Project's style of guerrilla film-making. Throw in a dash of the infected from 28 Days Later, and the result here is something that feels familiar, yet somehow manages to feel fresh by the time it all winds down. It's a film with little pretense and with one, singular mission: to scare the living hell out of audiences and have them jumping in their seats. And it largely succeeds on this level, as it's one of the better chair jumpers in recent memory. Full of creepy imagery and unsettling sound effects, [REC] is quite a roller-coaster ride, complete with a slow, tension building set up that builds to a frenzied crescendo. There's no fat in-between, as its scant but appropriate 75 minute run-time only captures the most vital of storytelling moments. The documentary-style film-making is an excellent complement to the film's story, as it essentially puts the audience in the same confused state of mind as the characters. Nearly half the film goes by before viewers even have an inkling as to what's going on, and the film never really comes to a full conclusion. The final sequence provides enough clues to draw a bit of a conclusion that would explain the film's events, but it's just ambiguous enough to let your imagination run wild. It's a perfect storytelling balance that stays true to the film's elliptical storytelling style and leaves the movie feeling like a random, chaotic moment that happened to be captured on film. It's this sense of chaos that drives the film's narrative, as Balagueró and Plaza exhibit a Romero-esque ability to capture confusion and hysteria. A feeling of perpetual claustrophobia pervades the film, as the enclosed quarters and paranoia are as problematic as the infected. It helps that all the characters involved are well done; obviously, we don't learn very much about them, but they feel very natural and never degenerate into caricatures. The standout here is Manuela Velasco who exhibits a natural charisma in the role of Angela. You can't help but be drawn in by her personality and charm, which pays off later when she's put through a nightmarish sequence at the end of the film. It's a sequence that's riveting and disorienting, as it literally puts viewers in the dark at times. This all might feel very derivative of the aforementioned Blair Witch Project, but it never feels like it's bordering on being a rip-off because the contexts are so different. The unsung heroes behind the film, however, are the sound designers: though [REC] will be remembered for many of its bizarre sights, it's what audiences don't see that is often even more effective. There's a cacophony of unsettling sounds, including mysterious wailing and loud crashes that make for an interesting aural experience. Due to the film's documentary style, there's no score to be heard, and this makes the film even more effective. There's one jump scare in particular that's effective precisely because it's captured so naturally, with its aftermath precisely captured in all its gory detail. 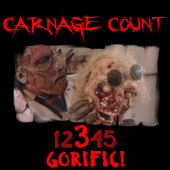 Speaking of gore, the film certainly has its share--bodies are pummeled, torn apart, and there's even a surgical scene that will have weak stomachs churning. The design of the infected themselves is not particularly ground-breaking for the most part, with the exception of the last one who makes an appearance: totally emaciated and more reminiscent of an animal than a human, this is the film's coup de grâce in terms of unsettling imagery and frightening special effects. Raw, visceral, and uncompromising, [REC] has just about anything a horror fan could ask for. Though there's little substance beyond all the style and shocks, it's a very well done thrill ride that's an entertaining assault on the senses. Sony Pictures has brought the film to Region 1 DVD, and it's a solid package as far as AV goes: the 1.78 anamorphic transfer captures the film's natural look, and the 5.1 soundtrack creates a very immersive soundscape that's vital to the experience. The long special feature is an 18-minute long making-of documentary. It should be noted that Balagueró and Plaza returned to the scene of the crime with the equally great [REC 2], and part three is also imminent. At any rate, the original film is required viewing as far as foreign horror goes. Buy it!